I’ve let this blog lapse, but a wise friend has been telling me that I need to write down stories before I forget them, so I’m back. The other morning, Sophie was eating cereal that had dehydrated strawberries on it. “Can I have this kind of dried strawberries as a snack at my birthday party?” she asked. We don’t often buy those freeze-dried strawberries, because of course they’re mostly pricey sugar, but for a birthday party snack, it was a good idea. I promised her we’d pick up some dried strawberries before her party, and then I went back to whatever I was doing, packing lunchboxes, unloading the dishwasher, braiding Soph’s hair: you know the morning blur. I noticed Evs taking that strawberry cereal from the table and reminded him that we have a food-belongs-in-the-kitchen rule. I don’t need my kids leaving crumbs all around the house; I can barely keep up with cleaning the crumbs in the kitchen. Then I returned to making my tea or locating the permission-slip that I had signed but somehow not gotten into the kid’s backpack or whatever else I was doing that morning. To Sophie. From Everett. Wherever you go, my heart will follow you. He got out his pens and tried to draw a heart on the curved edge of the package, before once again screaming in frustration, then calming down enough to take his package to add to Sophie’s birthday pile. Then he told her what her surprise would be, of course, because three-year-olds don’t keep secrets. She tried to explain that it wasn’t actually cereal she wanted, only a snack-pack of strawberries to serve to party guests, but even she had to admit that this was a surprisingly sweet act by a little brother who can sometimes be a pest, but is actually listening to everything we say, and doing his best to be generous. Here is a link to me on “Curious City” on WBEZ Chicago Public Radio. I am also on the Urban History Association Podcast, the single most fun piece of book publicity that I have done so far. I also published in the “Living Textbook” column of the Orange County Register and got featured in the alumni Newsletter of Yale Graduate School of Arts & Sciences. It turns out that book publicizing is surprisingly fun to do. My book is “hot off the presses,” according to the terrific new Urban Historians blog. 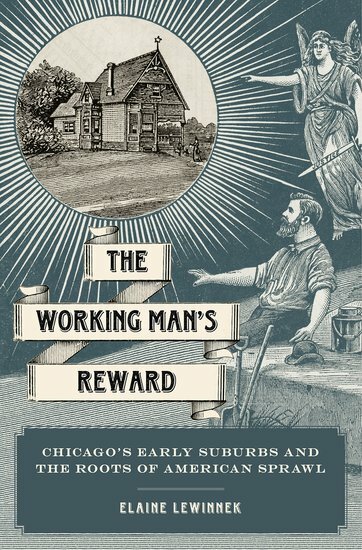 And, since this week is the anniversary of Chicago’s Race Riots of 1919, I blogged about that for Oxford University Press. Honestly, I do not know how book publicity works. This is my first book. So I am simply doing whatever occurs to me: blogging for whoever asks me, talking to journalists, going to conferences to mention it, and emailing friends who might teach the book to offer to skype into their classrooms. If you are teaching it and would like me to skype into your classroom, please contact me at elewinnek (at) fullerton (dot) edu. I like to meet my readers. And if you have read it, please consider leaving a review at sites like amazon or goodreads. Thanks! Friends threw me a fabulous book party. Then, for their annual backpacking trip, this year Ben & Sophie took along seven other dads and daughters. And they had a great time. Evs and I car-camped at the base and now he won’t stop asking for more camping. He has also requested that we change his name to Marshmallow Hotdog. Here he is “hiking” with me. Then we went to New England for a reunion with my family. Evs & Sophie got to see their five cousins. After that, Ben won the California state mountainbiking crosscountry championship. It’s been quite a summer so far. Here’s another photo of Hot-diggity-dog Marshmallow, the other morning, attempting to follow his Dad to work. And here’s my favorite photo of the summer of Sophie. The un-photographed moments include Evs making good friends at preschool; Soph attending a loving, small art camp; some strife between friends and me; a lot of good play dates; a new fandom for our local library; and jumping in ocean waves. Next up is a two-week trip to Colorado, in the new-to-us adventure van that we just bought from our neighbors. I’ll try to post more often here, after that. I just clicked on over and saw that I haven’t blogged here since November. Yikes. In my head, I have written several blog posts about the unexpectedly amusing overly-bureaucratic process of being Girl Scout Cookie Mom, about our struggles to help Sophie bridge the gap from wanting to hear advanced stories but being able to read only basic ones to herself, about the songs of “Frozen,” and about Everett settling in to preschool, finding his own stubborn independence and deep kind streak, going from tantrums to joy in a flash so quick that I am envious. But I haven’t actually written any of those down. Lately my family life hasn’t quite coalesced into blog-worthy stories in my mind. Maybe I am just out of the habit. Maybe I am becoming more private or at least more aware of the strangers who stumble on this blog, beyond just you friends and family whom I know. Maybe, especially as both kids get more articulate, I am experiencing what other mombloggers have already written about: their stories start to feel like theirs to tell, not mine. They are growing up. So I invite all of you who have been reading here to friend me on facebook. Or, I guess, just be patient. I’ll return to blogging eventually. Despite the tagline that I optimistically coined for this blog when I began it, I don’t actually write much about professoring here. Those conversations tend to happen elsewhere. Here’s one of those places, the “On Teaching” blog of the American Studies Journal, where I recently weighed in on the current debate whether to lecture or not to lecture with a third, less-binary option: lecture with engagement. Click on over if you’re interested. What is your favorite food? Mac-and-cheese. What does it look like?It is cheesey. How does it taste? It tastes salty, noodley, and cheesey. It is hard to explain. When I eat mac-and-cheese it tastes soft. That description: I love it. I love the combination of senses and I love that it is wholly original. I could not have described mac-n-cheese better myself. Reading that, I tried to tell her what a metaphor is and what a neat thing they are, but she didn’t care. She was off to the next project, practicing dance steps in the mirror. A few days later, she took this self-portrait with my phone. It’s not yet a masterpiece, you see, but the germs of storytelling are there. When I came in from taking the recycling out, Everett told me: “Sophie uh-oh,” and led me to the bathroom, where I found her spitting blood into the sink. It was a lot of blood, but I reminded myself that head wounds bleed profusely and everything was probably fine. I got her a tissue to absorb the blood from her split lip. I got her some ice to quell the swelling. I gently checked her teeth (now that it’s her second mouth injury, I knew what to do), and found the front teeth extremely wiggly. So I phoned her school to tell them we’d be late to school, then I phoned our dentist, who would open in 20 minutes. I left a message telling them we were on our way. Evs & Sophie had been piling pillows into a fort in our living room. Soph had climbed on the fort’s roof. The pillow-roof fell in and, on her way down, she hit her open mouth hard on the solid wooden chest that we use as a coffee table. Everett started wailing when he saw me give children’s tylenol to Sophie but not to him. Getting him out the door was a struggle, but everyone calmed down in the car, where I had a chance to tell Sophie the exciting news that the tooth fairy might be coming early now. I have, in the past, grumbled that this pediatric dentists’ office is ridiculously over-cheerful, but this morning I was grateful for it. This morning I was in love with my dentist’s office. They praised her bravery and calmly took x-rays, then sat her down watching one of those kids’ videos they play in the ceiling, which did wonders for her mood. As they poked around her mouth, they had to keep reminding her to please tell them when something hurt. She was more interested in watching “The Magic Schoolbus” than in talking about her injuries. Even Everett behaved himself, thrilled to explore their basket of toy trucks while I listened to the dentist explain that Sophie’s upper-front teeth had jammed into the small bone that holds them in, actually fracturing the bone of her upper palate, leaving a bloody line across the top of her gums. The bottom teeth jammed, down, too. And the lips bore the brunt of the impact. At least four teeth will probably fall out in the next week or two, which is fine, and we only have to worry if more than four fall out. We’ve got a lot of follow-up appointments with the dentist, now. I asked her if she wanted to go home to watch movies and eat ice cream, but she told me no, she wanted to go to school. She wanted to show off her dramatic injuries to her friends. I asked if she wanted me to try to wash the fuzzy pink bracelet she was wearing, now that it was splattered with blood. She told me no, blood is cool. I was enormously proud of her. So I took her to school and only realized how crazy an idea this was when the school secretary and nurse looked at us, aghast that I was dropping off a kid who was still bleeding. They asked the smart questions: What can she eat for lunch? Does she have a plan for sedentary play during recess time? I agreed to go buy some soft lunch foods, then return in an hour or so to check on her and see if she needed to be taken home. Evs and I stocked up on the softest things I could think of: bananas, hummus, yogurt, applesauce, pumpkin pie. We also stocked up on lip-chillers: popsicles and ice cream. And I started to think of all the ways Soph might injure her already fractured palate at school. Evs started to fade into sleep, but I kept him awake long enough to go retrieve Soph from school. “Please can I play one more round of rhyming bingo?” she asked, and then Everett simply howled, shrieking during the whole walk from her classroom to the car, probably terrifying hundreds of kids. When we got home, I finally realized how terrified I had been all morning, too. Soph herself is fine. Her lips are already less swollen, already forming the ugly gray scabs that the dentist prepared me to expect. The hardest part, I think, for her, is that the dentist declared she should avoid jumpy-castles for at least a half a week. She did art all afternoon, instead, while her brother whined about not getting to go to the park. They made a parachute-man, around sunset, when Ben took this photo. I think I may be more traumatized by my daughter’s injuries than she is herself. Such is the empathy of motherhood, I guess.